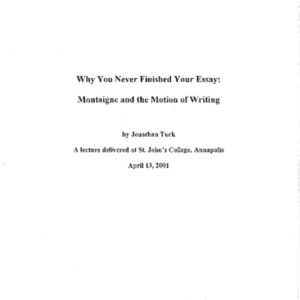 Typescript of a lecture delivered on April 13, 2001 by Jonathan Tuck as part of the Formal Lecture Series. 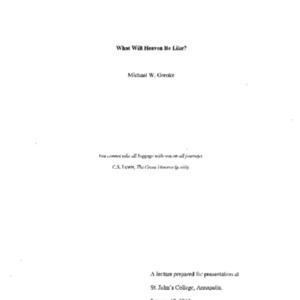 Audio recording of a lecture delivered on April 13, 2001 by Jonathan Tuck as part of the Formal Lecture Series. 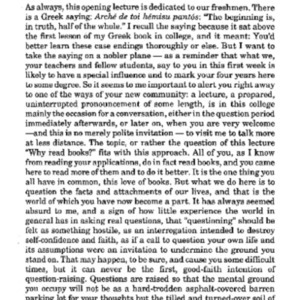 Typescript of a lecture delivered on August 30, 1996 by Eva Brann as part of the Formal Lecture Series. 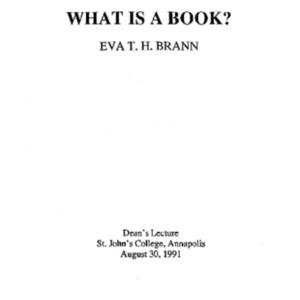 Audio recording of a lecture delivered on August 20, 1996 by Eva Brann as part of the Formal Lecture Series. Audio recording of a lecture delivered on April 19, 2013 by Elliott Zuckerman as part of the Formal Lecture Series. 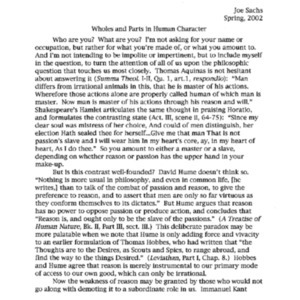 Typescript of a lecture delivered in Spring 2002 by Joe Sachs as part of the Formal Lecture Series. Who should elect the President? Audio recording of a lecture delivered on September 16, 2016 by Steven Crockett as part of the Formal Lecture Series. 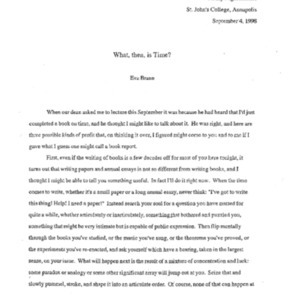 Typescript of a lecture delivered on September 14, 1998 by Eva Brann as part of the Formal Lecture Series. 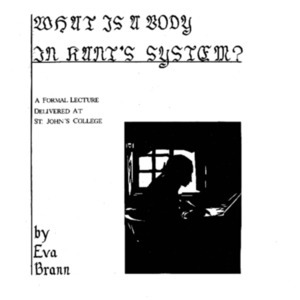 Audio recording of a lecture delivered on September 04, 1998 by Eva Brann as part of the Formal Lecture Series. 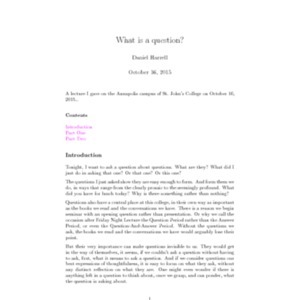 What is a what-is question? 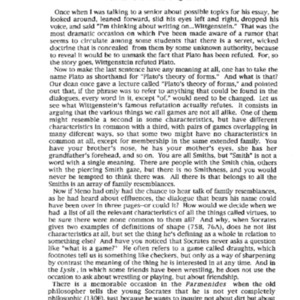 Typescript of a lecture delivered in May 1993 by Joe Sachs as part of the Formal Lecture Series. 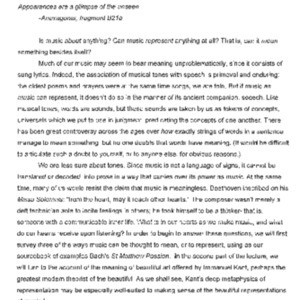 Typescript of a lecture delivered on October 16, 2015 by Daniel Harrell as part of the Formal Lecture Series. Audio recording of a lecture delivered on October 16, 2015 by Daniel Harrell as part of the Formal Lecture Series. Typescript of a lecture delivered on August 30, 1991 by Eva Brann as part of the Formal Lecture Series. What is a body in Kant's system? Typescript of a lecture delivered on May 8, 1972 by Eva Brann as part of the Formal Lecture Series.